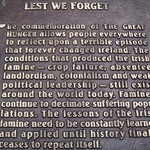 Coiste Cuimhneachain An Gorta Mór (Great Hunger Memorial Committee) hasn't added a story. To find the best design for our long-awaited memorial to An Gorta Mór, CCAGM will be launching a design competition open to sculptors and artists at any stage in their career. The prize for the winning design, which will be chosen by the Committee, is £5000. In order to fund this stage in the project we are launching this fundraising appeal which will have a closing date of 30 June 2016 or when we reach the target – whichever is sooner. This is an important stage in the process if we are to have the best memorial we can possibly have in our City. Coiste Cuimhneachain An Gorta Mór (Great Hunger Memorial Committee) hasn't posted any updates yet. Coiste Cuimhneachain An Gorta Mór (Great Hunger Memorial Committee) is managing the funds for this campaign.